Holy Mary, Mother of God and Patroness of the Order of the Visitation, Pray for us. Saint Margaret Mary, disciple and apostle of the Heart of Jesus, Pray for us. Thou who didst have the Immaculate Virgin for thy Mother and Mistress, Pray for us. Precious pearl of the Kingdom of Heaven, Pray for us. Thou who wast associated with the seraphim in adoring the Heart of Jesus, Pray for us. Victim and holocaust of the Heart of Jesus, Pray for us. Privileged adorer of the Heart of Jesus, Pray for us. Faithful image of the Heart of Jesus, Pray for us. Thou who, like St. John didst repose on the Heart of Jesus, Pray for us. Pure dove who didst make thy dwelling in the opening of the Heart of Jesus, Pray for us. 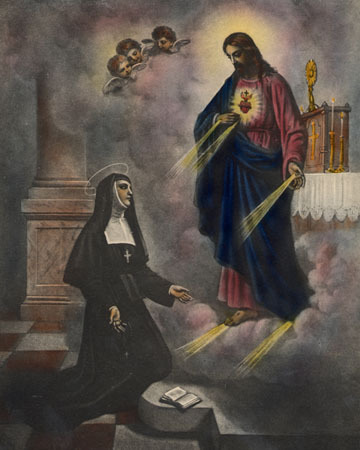 Thou who didst live profoundly hidden in the Heart of Jesus, Pray for us. Model of obedience and mortification, Pray for us. Faithful imitator of the meekness and humility of the Heart of Jesus, Pray for us. Violet of the garden of St. Francis de Sales who didst shed throughout the Church the good odor of Jesus Christ, Pray for us. Thou who wast crucified with Christ, Pray for us. Thou whom the Holy Ghost favored with the gift of prophecy, Pray for us. Most wise and gentle instructress of souls called to the religious life, Pray for us. Merciful advocate of sinners, Pray for us. Charitable benefactress of the sick, Pray for us. Joy of they holy Order and glory of thy people, Pray for us. Thou who dost extend thy special protection to all who are devoted to the Heart of Jesus, Pray for us. O Lord Jesus Christ, Who hast wonderfully revealed to Saint Margaret Mary the unfathomable riches of Thy Heart, grant that through her merits and following her example, we may love Thee in all things and above all things, and may thus be accounted worthy to obtain an eternal resting place in Thy Heart, Who livest and reignest with the Father and the Holy Ghost, world without end. R. Amen.